John Whitehouse was born on 14th August 1886 in Regent Street, Woodsetton. From an early age he lived with his paternal grandparents. 55 Regent Street, Woodsetton, Staffs. Emanuel Whitehouse (53, Beer Seller, born Deepfields), his wife Elizabeth (51, born Coseley), their 4 children: James Enoch (20, Clerk, born Coseley), Hannah (16, Clerk, born Coseley), Elizabeth (13, Clerk, born Coseley), and Leanor (Editor: actually Leniva) (10, Scholar, born Coseley), also son John Whitehouse (4, Scholar, born Coseley). John is strongly believed to be their grandchild – he is described as grandson on subsequent census returns. 19 Regent Street, Woodsetton, Staffs. Emanuel Whitehouse (64, Beerhouse Keeper, born Sedgley), his wife Elizabeth (60, born Sedgley), their daughter: Leniva Jane Maud (20, born Sedgley), their grandson John Whitehouse (14, born Sedgley), and Hannah Flavell (20, General Servant – Domestic, born Sedgley). Emanuel Whitehouse (74, Out-door Beerhouse Keeper, born Deepfields), his wife Elizabeth (72, born Coseley), their married daughter: Leniva Jane Maud Cox (30, born Foxyards), Leniva’s husband Charles Harry Cox (33, Commercial Clerk, born Woodsetton), Leniva and Charles’s son: Charles Harry Cox (6, born Foxyards), Emanuel and Elizabeth’s grandson: John Whitehouse (23, Brewer, born Foxyards), Emanuel and Elizabeth’s 2 granddaughters: Elsie Whitehouse (17, born Foxyards), and Elizabeth Alice Maud Whitehouse (16, born Foxyards). Marriage of John Whitehouse and Emmie Richards registered December quarter 1915 in Dudley. The marraige took place at Providence Baptist Chapel, Coseley, on 16th October 1915. John enlisted in Birmingham in January or February 1915 with the 13th Battalion, Gloucestershire Regiment, we know this as he is listed as a recruit in the 19th February 1915 edition of the Dean Forest Mercury. The 13th Gloucesters were known as the Forest of Dean Pioneers, and became the pioneer battalion for the 39th Division. A will written by John, dated 14th November 1917, shows him still serving with the 13th Battalion. By the time of his death in August 1918, he had transferred to the 12th Battalion, Gloucestershire Regiment, known as “Bristol’s Own”. On the 25th and 26th April 1918, the 13th Gloucesters were virtually wiped out at Spoil Bank in The Bluff Sector, about 4 miles south-east of Ypres. Just 67 men were reported to have returned to Battalion HQ; the Battalion was never re-built and the rest were transferred mainly to the 12th Gloucesters. It is possible (although not proven) that this was the time John transferred to the 12th Battalion. The “Soldier’s Effects Register” records that John’s Widow and Sole Legatee was his wife Emma, actually her name was Emmie. She received her husband’s outstanding balance from the army of £3/2s/4d on 5th December 1918, and then his War Gratuity of £16/10s on 1st December 1919. The 12th Gloucestershire Regiment was in the 5th Division. In August 1918, the 5th Division had entered into what became a series of complex, endless, overlapping attacks that forced the Germans back in retreat, fighting through Albert back to the old Somme battlefield. On the 23rd August the 5th Division continued its advance from Bucquoy towards the village of Irles. On the extreme right of the 95th Brigade the 12th Gloucesters became caught up in the deep railway cutting and lagged behind the artillery barrage. As a consequence the battalion came under heavy machine-gun fire from the front and right flank and were unable to advance further than the ridge overlooking Irles. An advance by the 13th Brigade through Irles failed, and the Commanding Officer of the 12th Gloucesters organised their own further attack on Irles which was successful. Despite this success, almost 70 men of the 12th Gloucesters were killed on the 23rd August, or died from wounds on subsequent days. John was initially buried near where he fell very close to the railway line, ½ a mile north-west of Irles. In 1919 his remains were exhumed and he was re-buried in Queen’s Cemetery, Bucquoy. WHITEHOUSE. 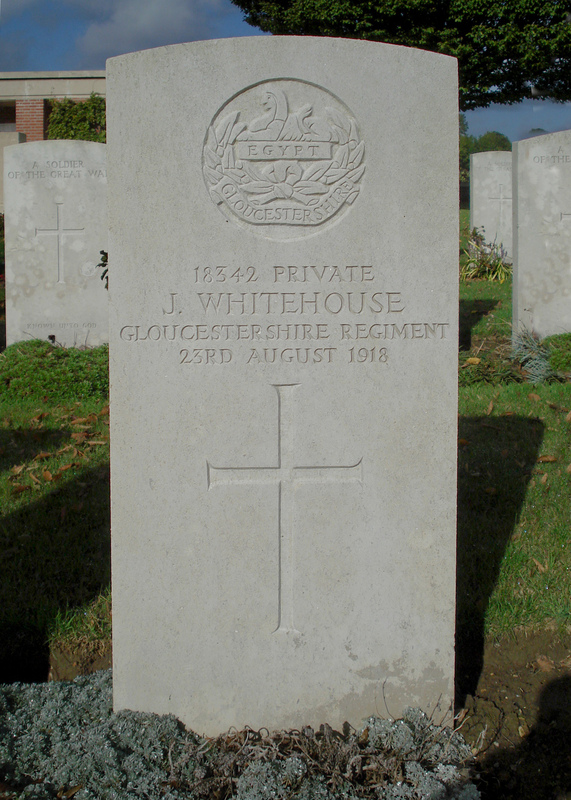 Private John, beloved son of Mr. and Mrs. Emanuel Whitehouse, Woodsetton. Killed in action August 23rd, after 3½ years service, aged 32. Deeply lamented by mother, father, sister and brothers. WHITEHOUSE. Killed in action in France, August 23rd, Private John, 12th Gloucesters, dearly beloved husband of Emmie Whitehouse, Turley Street, Parkes Hall. His resting place a soldier’s grave. WHITEHOUSE. Private John, 12th Gloucesters, killed in action, August 23rd. Fondly remembered by aunt, uncle, and cousin, and Gerald Wright. WHITEHOUSE. Private John Whitehouse, 12th Gloucesters, killed in action in France, August 23rd 1918. Sadly mourned by Aunt Len and Uncle Charlie. WHITEHOUSE. Private John, killed in action, August 23rd. Affectionately remembered by Aunt Eliza and family. WHITEHOUSE. Private John Whitehouse, 12th Gloucesters, killed in action in France, August 23rd. Sadly mourned by Aunt Alice and Uncle Jim, and Cousin Gilbert Latham. WHITEHOUSE. Private John Whitehouse, 12th Gloucesters, killed in action in France, August 23rd. Affectionately remembered by Mr. and Mrs. J. Richards and family, of Parkes Hall.